Although optimized for speed, the CAMP 100% mohair skins offer a decent blend of grip, glide, and durability. They feel a bit more plush than other race skins, and the polyester-reinforced cotton backing does a good job of holding the fibers in place. 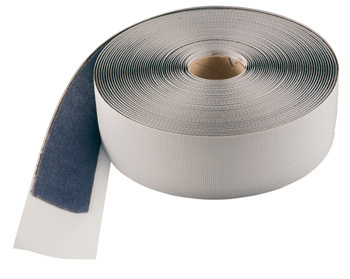 Cut straight and coated with easy-ripping glue, the silver skins are sold off the roll. For your convenience we price our skins per centimeter so you can get just the amount you need without overpaying. You'll probably need around 150 centimeters per ski, just put the length in the quantity field. Mohair fibers from Angora goats offer the best known glide for climbing skins. Parallel cut in widths of 38, 60, 62, 65, or 68 millimeters give you several coverage options. Works with any race tip attachment system, or you can roll your own. These are my first mohair/race skins and so far, so good. They definitely leave something to be desired in grip, but I'm coming from wall-to-wall nylon, so that's to-be-expected. Fitting your own tip attachment with bungee cord is easy if you can figure out a needle and thread (was my first time trying to sew anything and it turned out ok). Use seam grip to make the stitching abrasion-resistant. Pro tip: the glue isn't super strong, so if you're running these without tail attachments (as most are), you can easily refresh it with BD Gold Label glue. Paper shopping bag + hot iron (on the paper, with skins stuck to the other side) will remove skin adhesive quickly and mess-free. I beefed up the glue on the tips and tails only, leaving the rest of it as-manufactured. So far, no issues with them falling off. I used these skins for about a year then "loaned" them to my wife who has used them off and on. They do feel much more plush than Pomoca skins and seem to glide a tad less but grip a bit more. They do not have seem to be as water repellant as Pomoca skins even with waxing, maybe due to the plush factor? On the other hand, they seem very durable and while I have chunks of mohair missing from my Pomocas, these skins have held up very well. I think that they make a great durable training and adventure skin as long as you avoid wet snow. Regarding the skin glue, it did not seem to last as long as my Pomoca glue did before requiring regluing. Im not sure if this is a big deal as re-gluing is something all race skins need eventually. It was interesting to me that the glue seemed to get dirty really fast but then I realized that since the fabric is white (may 2 Pomoca skins have black fabric) these skins really provided a better view of all the junk that is probably stuck on all my skin's glue!